BARTI is sponsoring candidates of SC community to undergo CDAC Diploma in Advanced software Development & Methodologiest (DASDM) course of about 9 Months duration. The total no. Of seats @ Nagpur- 100, Aurangabad- 100, & Pune- 200. 50% seats are reserved for women & 3% for Disabled persons. After completion of DASM cource, it helps to work as Software Developer, Programmer, Tester, System Analyst in IT industry & associated sector. 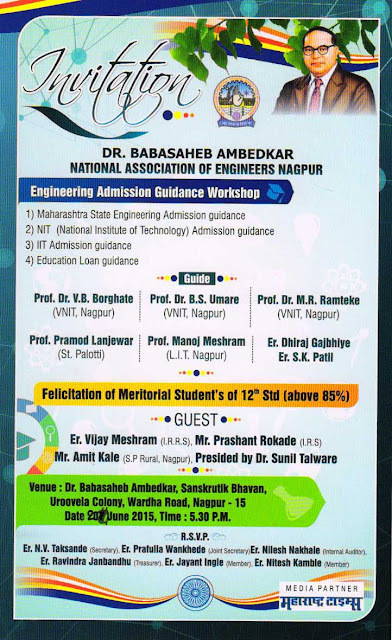 Workshop shall be held on 20th June 2015 @ 5.30 pm @ Banae Hall Uroovela colony Nagpur. Felicitation of meritorious students of 12th standard will be also held on this occasion. Interested students can register their names upto 5.30 pm of scheduled date.